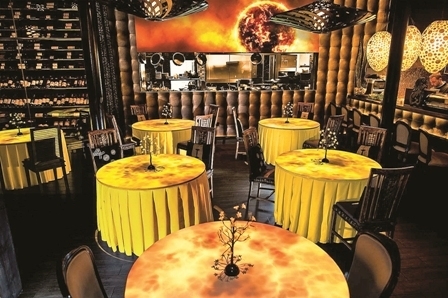 Monkey Group’s award-winning Asian fusion restaurant, The Oriental Monkey in the Oasis Commercial Centre in Playa de las Américas, is currently offering a gastronomical experience that is guaranteed to leave you awestruck. 17.03.2015 - Their tasting menu ‘journey’ which is entitled WOW! aims to simultaneously awaken and excite your senses with a 10 course selection of international styles mixed with complimenting wines, spectacular visual lighting and ambient music created especially for the occasion. It took 10 months of incredible teamwork, creativity and ingenuity to present this final concept. Kitchen and restaurant staff, designers, decorators, video experts and graphic designers were all involved at the beginning. The owners, Carlos and Javier Cabrera, oversaw every detail and it’s clearly in their makeup to continually surprise diners by creating unique styles and ideas. Oriental Monkey was awarded Best International Cuisine Restaurant in the Canary Islands in 2013 and in October 2014 they launched this culinary round-trip across the globe, departing from and returning to the Canary Islands and taking in many exotic destinations throughout. The Oriental Monkey’s distinctive trait is Nikkei cuisine; however it is also influenced by Japanese and other touches from different parts of the world. For WOW! head chef, Nacho Hernández has created a menu for different regions, and in each one is an unforgettable experience that’s highlighted by individuality in taste and flavour. The tour starts with a cocktail then begins its geographic roundtrip in the Canary Islands with an inventive banana appetizer. The excellent staff members then ‘strap you in’ as you visit Latin America, where you will try Ceviche (marinated fish), Mussels with Chalapa (marinated vegetables) and Causa Limeña. Next comes a tantalising selection of Nigiris from Asia, followed by a flavoursome Tom Yam soup, typically from Thailand. As you wait between plates, the bubbly staff invite you to try wines that best suit each dish, and explain in detail what foods you are about to try, and even which order to eat them in for the most effective taste explosion. From Asia you nip across to North America for a dish called Alaskan King Crab; which is certain to impress and is one of their star recommendations on the menu. This incredible journey is all the while accompanied by high-tech images that are projected onto your table adding tremendous atmosphere; whirling and swaying and symbolising the part of the world you’ve stopped in. After Alaska comes Africa, and a rich Tuna Tataki with couscous and smoked aubergine. It’s all onboard again, as you’re whisked off to Europe to savour Min Pao stuffed with duck, mushrooms and foie gras. Following this delicious dish is a return trip to East Asia, where Pork Cheek with teriyaki and truffle sauce is served. This excursion ends with a dessert stop in the Canary Islands, where the inventive – and explosive – Volcanic Stratum concludes the breathtakingly impressive WOW! experience! The ambience created by the cutting edge technology, music and imagery is definitely one of the key elements of the night. A video of natural themes that correspond with the trip and match the stylish surroundings is beamed onto your table and all around you during the entire meal. An aquarium, exotic flowers, and elegant touches from the countries you visit adorn this beautiful restaurant, while the visual treats are serenaded by perfectly orchestrated melodies whose rhythms are in unison with the surrounding illumination and stylish furnishings. Monkey Group is a consolidated restaurant company founded in Tenerife in 2005 and has extensive experience in world cuisine. It is a project based on creativity that has seen them become a leader in the Canary Islands. Each of their restaurants has its own character, the result of a careful balance between gastronomy and design that gives each establishment a unique charm. The food is highly creative based on traditional styles and made with the best quality products. There are four restaurants located in the south of Tenerife: Monkey Bar & Grill is a new concept of modern BBQ; Monkey Beach Club offers excellent Mediterranean cuisine; Monkey Bravo! Italia is a Tuscan-style restaurant with an extensive menu of traditional Italian cuisine; and The Oriental Monkey serves Asian fusion cuisine. The wonderful eight course WOW! tasting menu lasts approximately two hours and is priced at €75 (drinks not included). Reservations can be made from Monday to Saturday, 7pm to 10.30pm. Please call on 608 595 491or visit the website: www.grupomonkey.com/wow. Gallery: Bow down to WOW! Produced with news.CMS in 0,0655 seconds.